ILLINOIS -- It may not have been an airtight case--the body was missing and there were no photos or tissue samples--but a Crystal Lake man was found guilty on Wednesday of animal cruelty. "The crucial part of this is the admission by the defendant" that he poured boiling water on a squirrel, said McHenry County Circuit Judge Charles Weech. "It ties it all together." John Grivas, 76, of the 100 block of Ellsworth Street was ordered to serve one year of court supervision, fined $250 and told to donate $250 to the Illinois Conservation Foundation. Grivas, who could have received a year in jail for the misdemeanor, declined to comment. The judge dismissed a charge of unlawful trapping against Grivas. During the bench trial in the Woodstock courthouse, Betty Bill testified that on Jan. 8, 2006, she watched Grivas, her next-door neighbor, place a wire-mesh trapping cage in his back yard. He stood over it with a camper's tea kettle, she said. Grivas tipped the kettle over the cage in a pouring motion three times, she said. Although Bill said she couldn't tell what kind of animal was in the cage, she testified she saw a tail moving wildly. Grivas took the cage to an alley behind his house, Bill said. She found the squirrel curled up in a ball in her yard, its fur matted down and wet. Conservation Officers Tom Davis and Jeffrey Kelley said they noticed red welts and patches of missing fur on the animal and believed it was dead. When the squirrel twitched, Kelly hit it with a baton so that it wouldn't suffer, he said. The officers said they asked Grivas why he poured boiling water on it. "He responded that he was just so mad at them for chewing the window sills," Kelley testified. Patrick Walsh, Grivas' attorney, argued that prosecutors didn't have any evidence tying the squirrel to his client. The only thing Bill saw was a tail, Walsh said. "We have a tail," he said. "Did it belong to a fox or a skunk, a red squirrel or a gray squirrel?" Walsh argued that police did not take any photos of the squirrel or tissue samples to connect its injuries to a scalding. "Where's the squirrel, Judge?" Walsh said. Davis testified that the squirrel was in a storage freezer with a deer. The bags froze together, and the squirrel's body somehow decomposed, he said. "It's not about what DNA this squirrel has or whether we have the squirrel here," Assistant State's Atty. Daniel Taylor said. "Pouring boiling water over a squirrel is cruel. It's about a conduct of essentially scalding this animal." UNITED KINGDOM -- A TWO-YEAR-OLD girl is recovering well after being attacked by a dog which has since been put down. 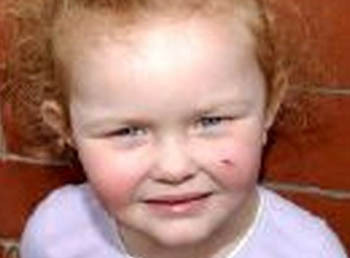 Little Morgan Stanley-Leedham was asleep on the settee at her home in Turf Lane, Chadderton, last Thursday evening when the Staffordshire bull terrier attacked. Mum Maxine, who was looking after the dog for a friend, was with Morgan at the time. She said: "Morgan was going asleep in my arms and I got up to go to the toilet and put her on the settee. The dog just suddenly pounced and bit her on the face. I grabbed her and we ran upstairs. The dog sat at the bottom of the stairs growling. "I phoned the sister of my friend and told her to get him to come round and get the dog, but luckily he was coming round anyway to take it for a walk. "We took Morgan to hospital where she had treatment to a small cut below her eye. It isn't too bad and she is up to date with her injections so she didn't need anymore. "The owner said he was going to have the dog put down because it had bitten Morgan." The Staffordshire bull was about four years old and called Nico. Maxine added: "He had been staying with us for four weeks and hadn't caused any problems. He was great with the kids even when they were getting him in headlocks and pulling his tale so I can't understand why he pounced just like that. "I'm sad the dog has had to be put down, but thankfully Morgan is none the worse for her ordeal and even says she wants another dog. I'm not so keen." Controversy over so-called dangerous dogs has been in the headlines following the death of five-year-old Ellie Lawrenson who died at her home in St Helen's on New Year's Day after being mauled by a pit bull terrier. OHIO -- An 11-year old Ohio boy was hospitalized after being attacked by a neighbor’s akita dog. The dog was being walked by its owner, but pulled away from its owner to attack the boy, who was riding his bike nearby. Interestingly, local authorities reported being called to the owner’s home in December in order to break up a fight between some akita dogs that she owned. The boy was hospitalized with multiple bite and puncture wounds. This story highlights the dangerous nature of akitas who are being recognized as a dangerous breed of dog. They certainly do not have the notoriety of pit bulls, but their great size and power and aggressive nature make them just as dangerous. Akitas were one of the breeds of dogs being singled out for special attention by the insurance industry, as I noted in a January 3 blog entry.